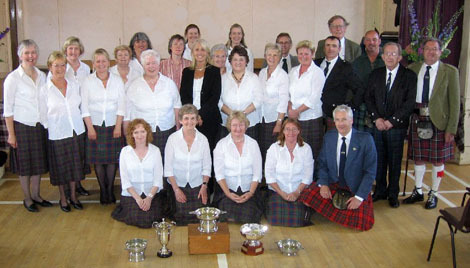 Aberfeldy & District Gaelic Choir won all its competitions at the annual Perthshire and Angus Provincial Mod on Saturday 14 June, despite stiff competition from Cumbernauld Gaelic Choir and Dundee Gaelic Music Association. 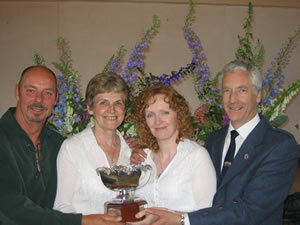 The haul of silverware included a new trophy presented by the Aberfeldy choir in memory of its former Gaelic tutor, Helen T Macmillan, who died last year. It will be known as Cuach Chlachmhor, which was the name of Helen’s house in Aberfeldy, and is awarded to the choir with the best overall marks in Gaelic in the senior choral competition. The Aberfeldy choir also won the coveted Westcroft Trophy, singing “Gleann Bhaile Chaoil”, and “Soraidh”, and the May Mitchell & Frances Matheson Cuach for the Puirt a’Beul (mouth music), with “Siud a bhalacha” and “An Gille Mor Foghainteach” (Strathspey & Reel).